Biological controls include a number of predator insects, specially adapted to feed on HWA. Most are predator beetles are collected from the wild in the US Pacific Northwest and Japan (where HWA is native), or reared in labs for release on the east coast. It is important to note that several beetle species have been evaluated and tested as biological controls by the USDA and others; and they do not all perform the same. They all have their pros and cons and their performance is still being assessed. 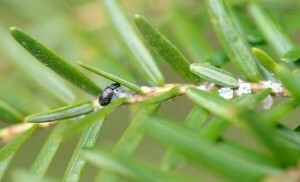 None are likely to act as a stand-alone silver bullet; though, they are considered to be an essential component of long-term hemlock woolly adelgid (HWA) control. An overview of several species that have been evaluated can be found here. Laricobius is a genus of beetles in the family Derodontidae, the tooth-necked fungus beetles. There are three species native to North America: L. nigrinus and L. laticollis are native to western North America, and L. rubidus is native to eastern North America. All members of the genus Laricobius are only known to prey on adelgids. The other three genera in this family of four genera feed on fungi or the by-products of fungal metabolism. This family is not commonly encountered in the field, possibly due to its small size (< 3 mm). The species that has so far shown the most promise as a biological control agent is Laricobius nigrinus, a predator beetle native to the Pacific Northwest. 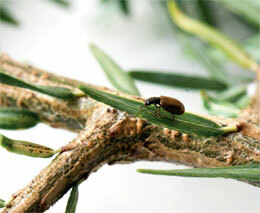 It has been found in close association with HWA on western hemlock, Tsuga heterophylla, in the Pacific Northwest, where HWA is not considered a forestry pest. L. nigrinus is active from October to March; both adults and larvae will consume all stages of HWA: eggs, nymphs and adults. After exhaustive evaluation in quarantine labs, it was cleared by the USDA for use as an HWA bio-control in the eastern United States in 2000 and has been released in NC since 2003. As of 2009, field-caught and/or lab-reared L. nigrinus have been released in 15 eastern states. Additionally, a potentially more cold-hardy strain of L. nigrinus from Idaho has been released in northeastern states where low winter temperatures may challenge the pacific strain. Follow this link to learn about Laricobius osakensis, the newest dinner guest. This publication from the US Forest Service also outlines the history of biological control of HWA in the eastern US.